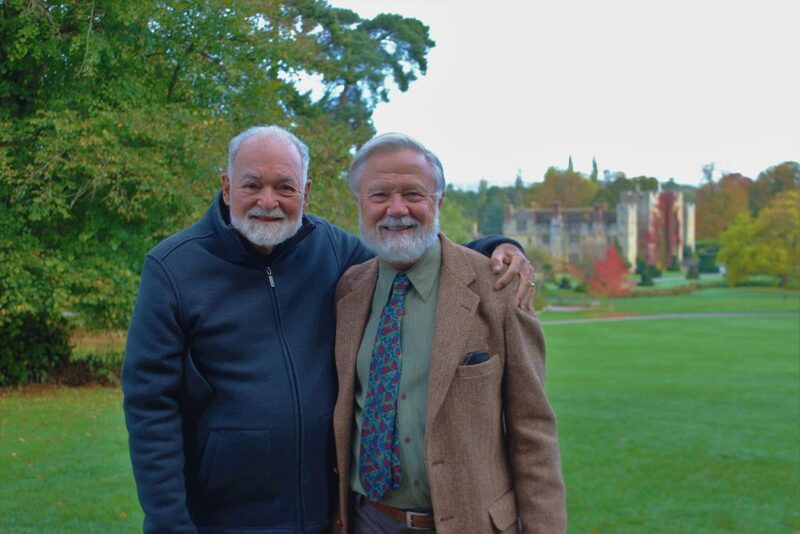 T2H2, the two happy husbands, Leo and Iory pose on the vast expanse of velvety green lawn surrounding Haver Castle Edenbridge, Kent, England. We were visiting there on the country leg of our Autumn tour this past October. 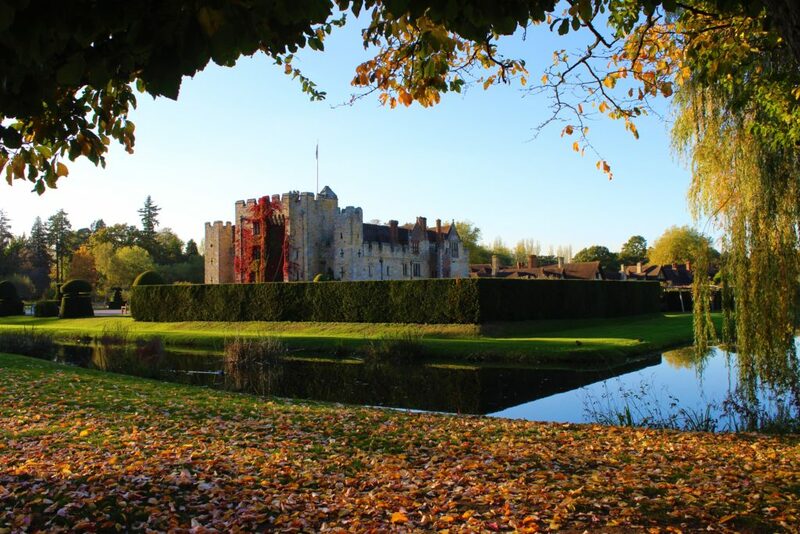 Hever was the ancestral home of the Bullen family (Boleyn) from whence sprang the ill-fated Anne, second and brief wife of Henry VIII. The Castle has a 700-year story of tumultuous history recounting the vicissitudes of unleashed ambition. Poor Anne was but one of a long line of miscreants jockeying for power with all the resources that clan, deportment and physical allure could muster. 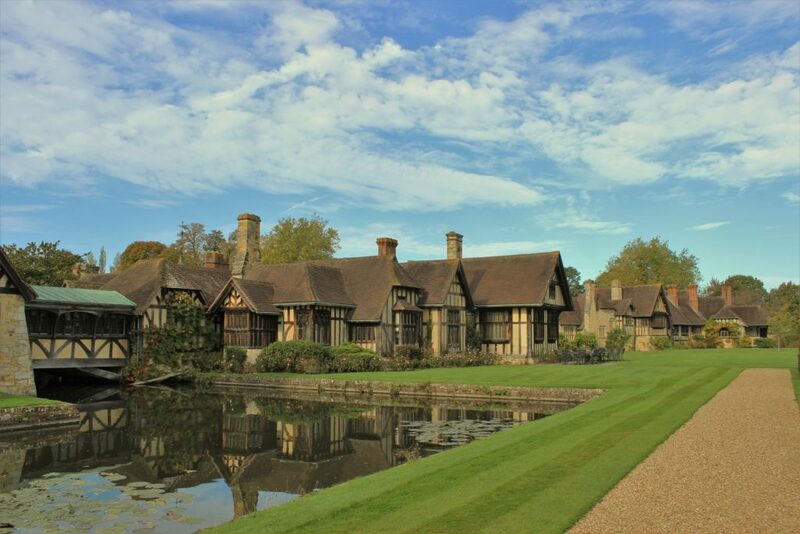 Hever Castle was extensively restored and add to (1903-08) by William Waldorf Astor, a New York millionaire and scion of a family of successful fur traders who eventually parleyed their wealth into Manhattan real-estate. The Astors reached the zenith of success with the creation of the famous Waldorf-Astoria Hotel. But not content with the crass accomplishments of “trade” and infuriated by family squabbles concerning which branch of the Astor family should dominate New York society, William roared across the Pond, eschewed his mercantile past in the colonies and became a British subject. Once regally ensconced in London and his newly acquired stately home Cliveden in Buckinghamshire, he judiciously lavished huge amounts of cash on various charities thereby securing the attention of the crown. Thus, he won recognition and honors in the form of a peerage of the United Kingdom under the title of Baron Astor of Hever Castle and then subsequently elevated to the rank of Viscount. Viscount Astor’s restoration of Hever Castle was lavish and extensive and included all the then innovative conveniences of electric light, central heat, running hot water and copious amounts of plumbing, all of which lubricated the ponderous machine of Edwardian extravagant pageantry known as country house parties. The interiors of the main castle were recreated in an eclectic pastiche referencing various English historic sources and are carried out with exacting detail of high quality in design, craftsmanship and rare materials. All these handsome and historically evocative interiors are very much in the spirit of their day in both England and the United States and are reminiscent of the Rothchild and Vanderbilt styles of grandeur. The most extensive component of Viscount Astor’s scheme was an enormous stretch of guest suites consisting of 100 rooms accessed from the Castle by an enclosed bridge across the surrounding mote and designed to evoke a Tudor village. This architectural extravagance is now referred to as the Astor Wing and is run as an hotel of sumptuous luxury. Leo glibly tossed off his intent of staying there when we return to England. I will to hold him to it no matter how many pennies we have to pinch in the meantime because my heart goes pitter-patter just at the sight of the place from the outside. 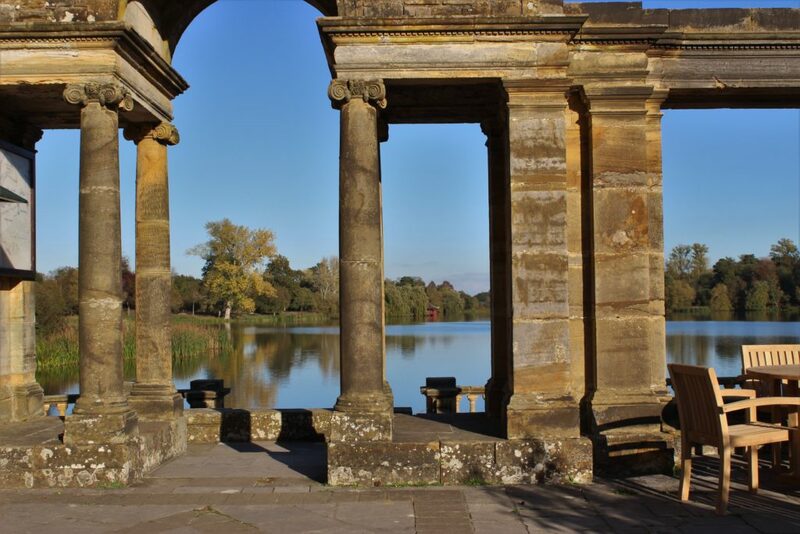 As an overnight guest at Hever Castle one can access the gardens after the high tide of tourists has receded leaving the place to the heavenly peace and calm of English twilight evenings. 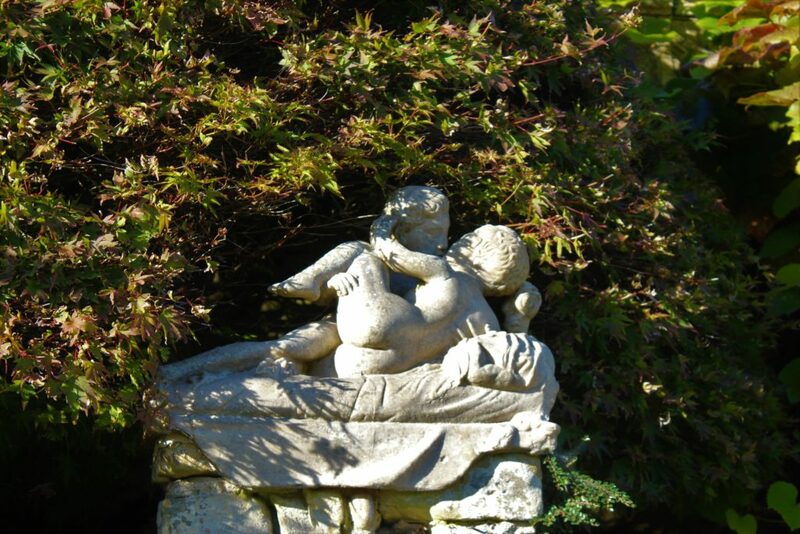 This is what, of course, enchanted my husband, the Hever gardens, which are scrumptious! Along his gilded path of happy destiny, William Astor was appointed by President Chester A. Arthur as the United States as Minister to Italy in 1882. Once installed in Rome Minister Astor immersed himself in the appreciation and study of Italian art and especially sculpture. 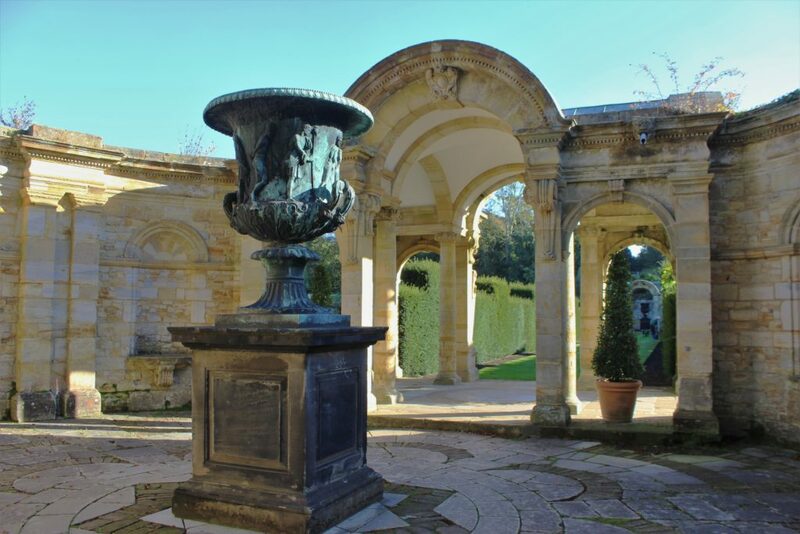 As any self-respecting gentleman on a grand tour would do, he began to amass a rich collection of antique statuary and architectural artifacts which eventually came to rest in the most romantic setting at the Hever Gardens. The afternoon when we were there, late October, the main display of summer exuberance had withdrawn leaving the structure of green garden lightly sprinkled with late roses against a background of russet colors glowing from the surrounding collection of specimen trees turning with the season. All this was accented here and there in protective niches with urns planted with drooping fuchsias placed beneath sturdy trellises entwined with ripening grapes, jewels of deep amethyst and alexandrite color, kissed by the setting sun. 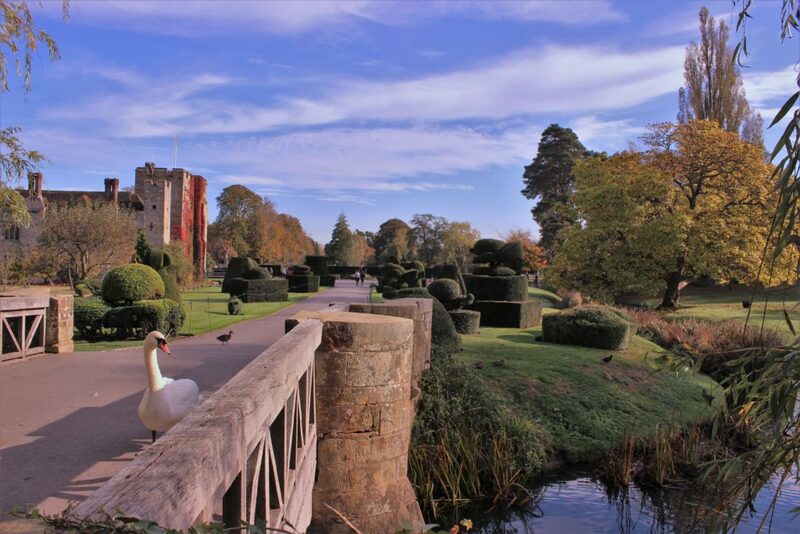 We were some the first early morning visitors to Hever Castle and enjoyed the peace of the place where a regal swan was parading his glory in company of a scattering of ducks. A little later they all retreated to the clear stream below, disdaining the intrusion of tourists and pretending not to be at all interested in the crumbs and tidbits from the café that a few eager children offered them. The pert castle offers a dignified presence softened by Boston Ivy blushing deeply against the honey colored stone. 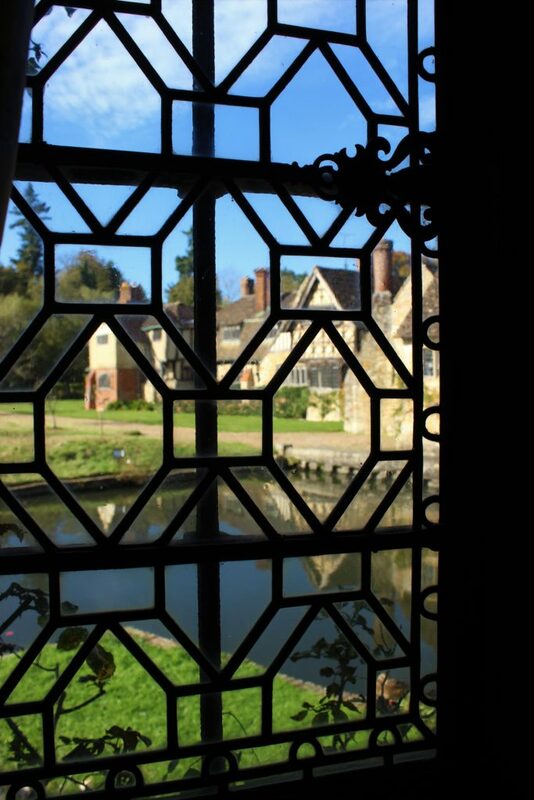 The Tudor Village now called the Astor Wing is my idea of heaven. I love all the meandering digressions trailing off into the distance. I can picture a labyrinth of hallways within, leading to remote chambers lit by the wiggly glass of leaded windows screened in diamond patterns. 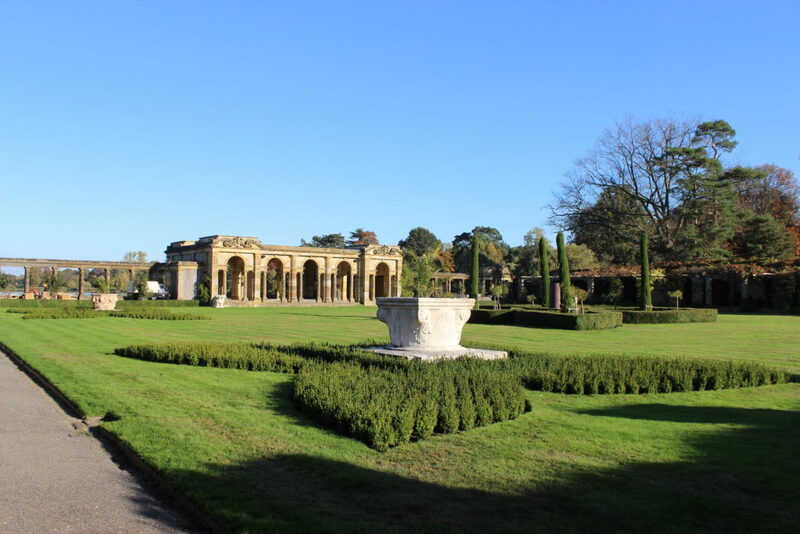 The many gabled tiled roofs create a syncopated rhythm that leads a parade around the surrounding gardens. This is now a hostelry of exceptional charm with suites of rooms and banquet facilities worthy of Henry VIII and his court, although that magnificent prince would be completely astounded by the amenities of the 21st century. Just inside the 13th century gate house, crowned by battlements, hangs the ancient and menacing portcullis said to be one of the oldest working defensive gates in England. The Timbered framed Tudor manor house with leaded windows is a later addition to the castle built by the Bullen clan in the early 1500’s. A spiral staircase accessed through the smaller arched doorway leads up to the guardroom and council chamber with connecting chambers used by the lord of the manor and his family as living quarters and from whence he governed his domains. 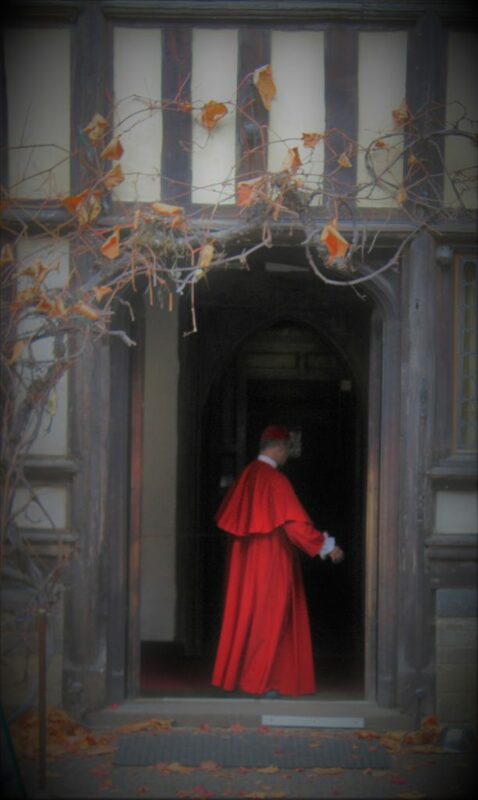 A ghostly apparition, greeted us at the front hall door of Hever Castle. 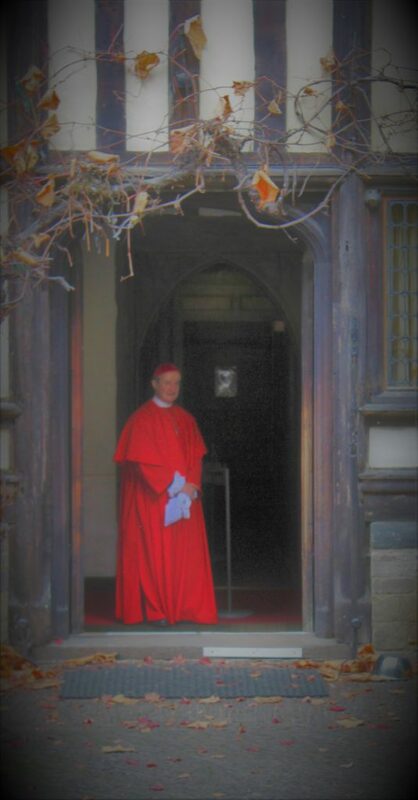 Like the fading scarlet ivy leaves above the entrance, this Prince of the Church and his ilk would be torn from their Popish vine by the wintery blasts of Henry VIII’s disfavor when he dissolved the Roman Catholic Church in England in order to marry the daughter of th Hever, Ann Boleyn. 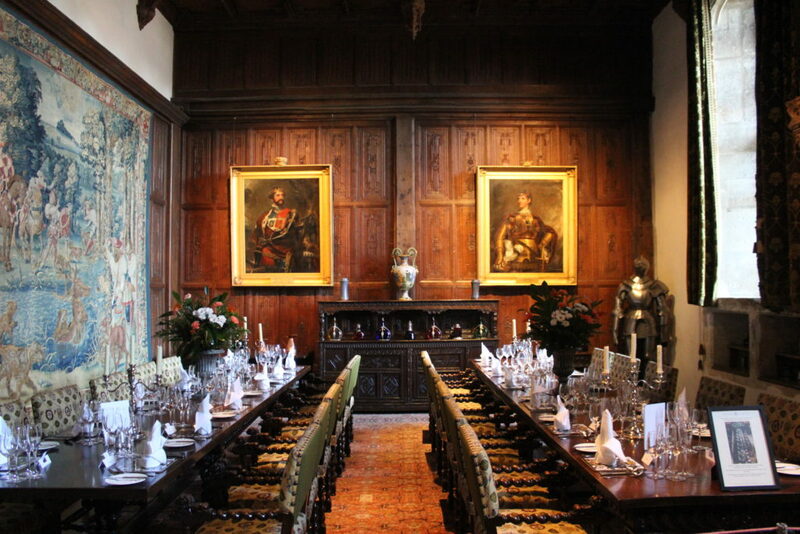 The Inner Hall of Hever is paneled and appointed with sumptuously carved Italian walnut installed in 1903 by William Waldorf Astor. It provides a solemn background to display a collection of important portraits of the Tudor Monarchs and some of their contemporaries. Here we see Isabella of Portugal, wife of Charles V who was the nephew of Catherine of Aragon, Henry VIII’s first wife. The hall also includes a rare collection of 17th and 18th century furniture as seen here providing some comfort to the formal gravitas of the room. 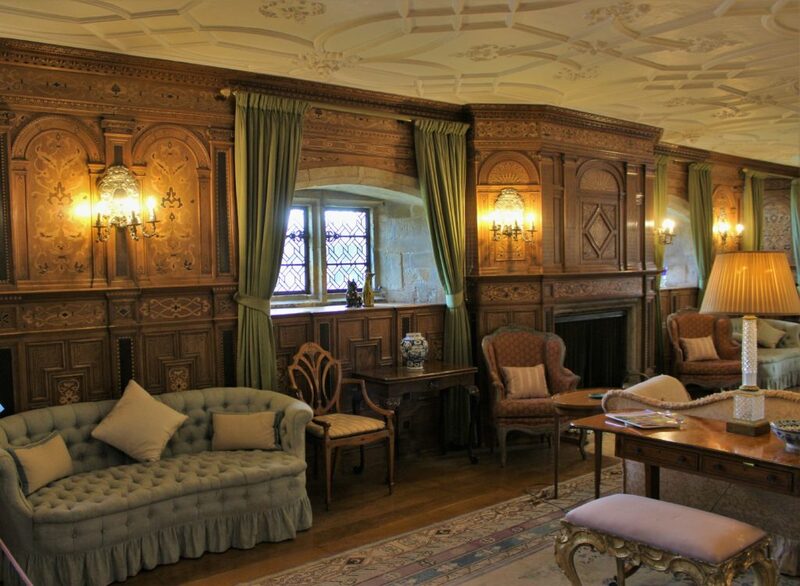 The drawing room at Hever is a delight of comfort and ease in what could have been a rather formidable display of historic gloom. This happy result is also part of Viscount Astor’s restoration campaign. The inlayed paneling of; oak, bog-oak and holly woods is exceptionally handsome and was patterned after Sizergh Castle, Cumbria. Here is one jim-dandy dining room which can be engaged for your next blow-out banquet! I should imagine the price tag is a whole bunch of shekels but hey, what price glory? Two Celebrated royals flank the paneled wall, Henry V, victor of Agincourt fame (1415) and Edward, the Black Prince, whose name derives from the tint of his armor rather than his ruthless conduct at Crecy, Poitiers, Najera and Limoges. In this last campaign Edward massacred 3,000 of the city’s inhabitants. I am not sure if these bellicose warriors are the exact diner companions I would ask for, but Hever is a castle and that does imply might is right. 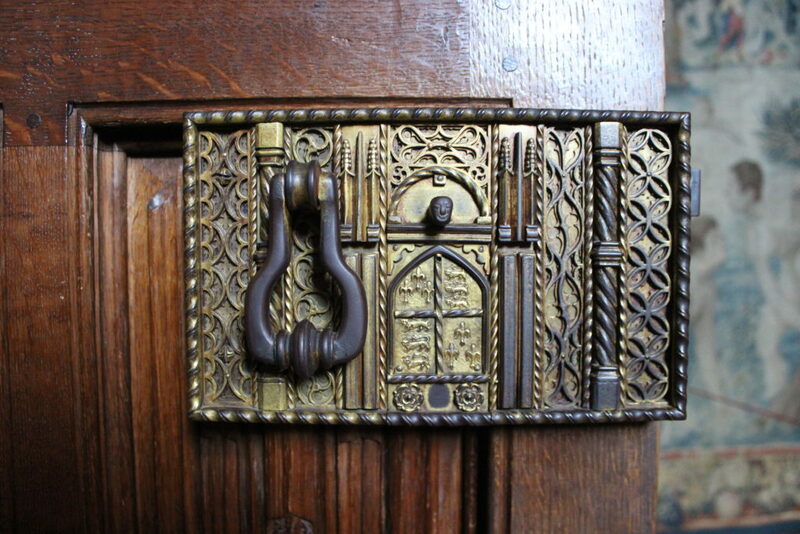 On the dining room door is an ancient lock once belonging to Henry VIII. In addition to the copious number of fixtures and furnishings the Tudor court traveled with, Henry, ever leery of assassination, brought his own locksmith to secure his bedchamber against demise. This is one of the myriad of historic details that Viscount Astor included in his restoration of Hever. I am particularly fond of the smiley face above the coat of arms, apparently emojis are nothing new. And on that subject, I have come to find out through Google magic that emoji derives from Japanese, from e ‘picture’ + moji ‘letter, character’. Please forgive this non sequitur digression but we are talking details here. Now, libraries are just my kind of thing, I know these phrases break the mood of my narrative but otherwise you may find my predilections a bit stodgy. 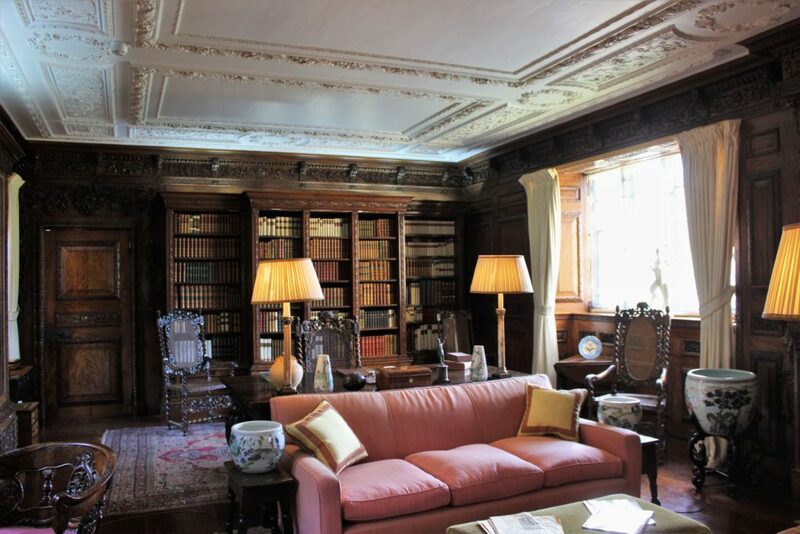 So, back to books and their dwelling place, Viscount Astor’s library is knock your sox off fabulous, there you go again Iory – I know but what the hell else is one supposed to do on a pink couch but kick off the shoes, get comfy and read? In this case the books are works of art in their own right with luxurious bindings of Moroccan leather, gilt-tooled with the Astor coat of arms and further elaborate incised decorations. They were privately printed in Paris and New York in the 17th, 18th and 19th centuries. The bookcases are patterned after ones in Samuel Pepys library. They are carved in the style of Grinling Gibbons and fashioned from sabicu, a very hard wood that will sink in water. The ceiling is copied from one at Hampton Court Palace. 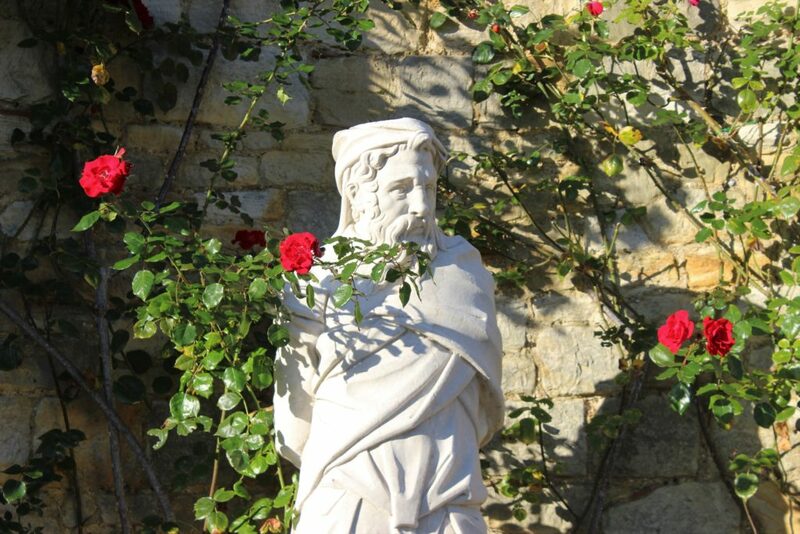 The evocation of history is ever present at Hever. 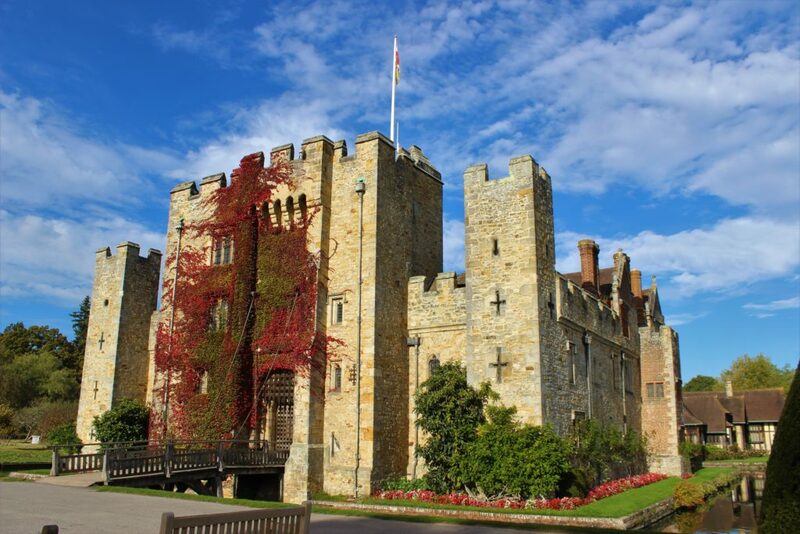 Hever Castle was the childhood home of Anne Bullen (Boleyn) and her family who were some the most powerful aristocrats of the period. Her father was a diplomat sent on numerous missions to the Continent under Henry VII and VIII. Anne was extensively educated at the royal courts of Margaret of Austria in the Netherlands, Mary Tudor and Queen Claude of France where she held positions as maid of honour. She returned to England and became a maid of honour to Catherine of Aragon, Henry VIII’s first wife. The unfortunate Anne was also, along with her family, a consummate schemer. She was none the less a tragic character, simultaneously Queen and pawn on a chess board of complex power dynamics that amongst other dramas allowed for the creation of the Church of England as a result of her marrying Henry VIII. 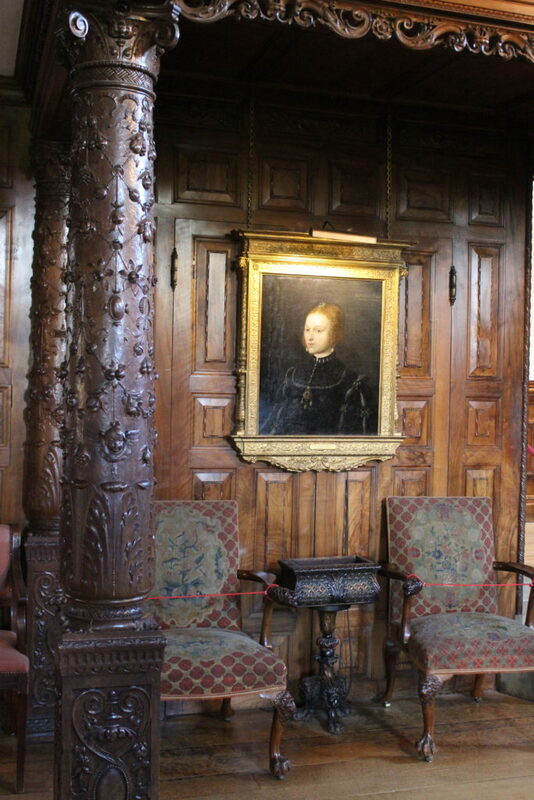 Haver Castle houses and displays an important collection of Tudor portraits In the Long Gallery alone there are 18 original portraits hung in dynastic order relating the story of the Tudors starting from Henry VI and ending with Henry VIII. 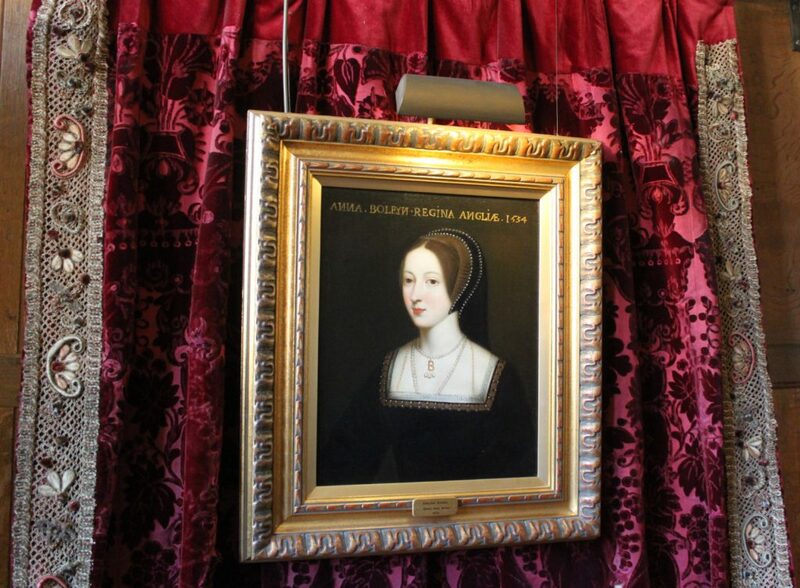 In the inner Hall on the first floor are portraits of Henry VI, VII, VIII as well as Anne and her sister Mary Boleyn. 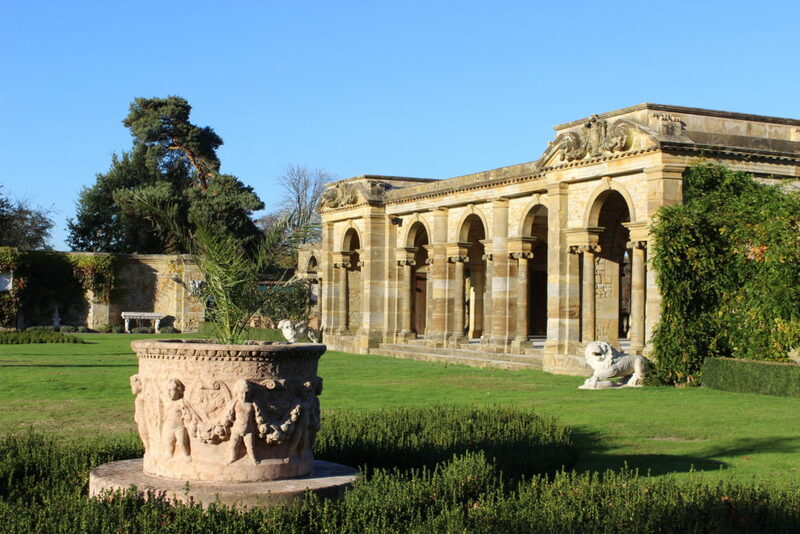 These collections were begun by Viscount Astor and richly enhanced by the current owner, Broadland Properties, John Guthries, founder and chairman. I’m never sure if wax mannequins are anything more than creepy. 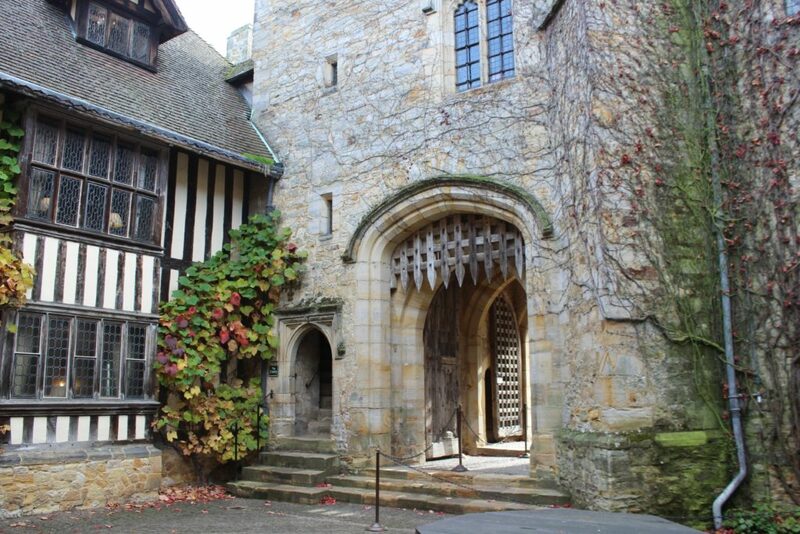 Hever has apparently had extensive displays in the past in the Long Gallery composed of the infamous womanizer King and his entire retinue of ill-fated wives accompanied by a lute playing musician. This musician was Mark Smeaton, who was one of the accused lovers of Anne and was also tortured and executed. There is a long history of wax mannequins in England begun by Madame Marie Tussaud who in 1831 after a long slog throughout Europe and the provinces of England brought her famous collection of gruesome relics from the blood drenched guillotine to London. She eventually coming to rest at the Baker Street Bazaar – ironically a famous street with a similar subject matter, heinous crime – thank you Sherlock. 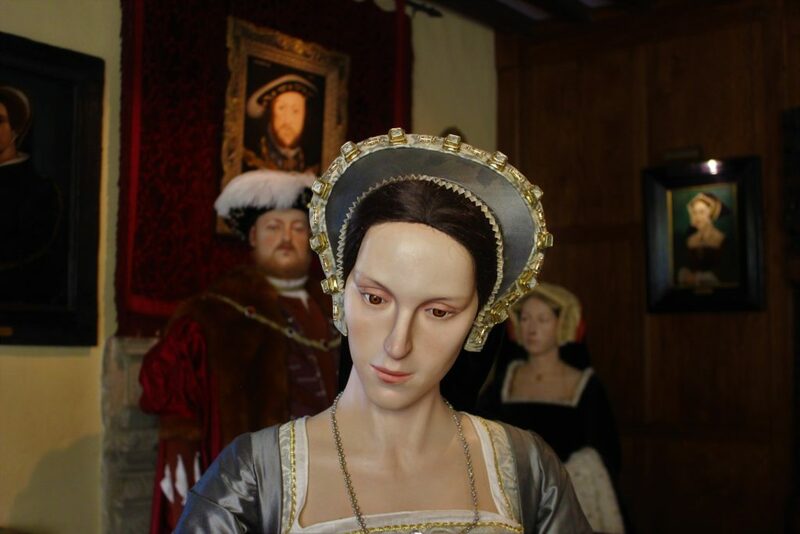 Here we find Anne Boleyn with down cast gaze looking remarkably real with Henry and Catharine lurking in the shadows – or is it Mary, Anne’s sister who was mistress to the king before her. Henry’s lascivious and marital convolutions are hard to follow but the result for Mary was a dead end and here she seems to presage that demise with a ghostly and dare I say it, waxen pallor. 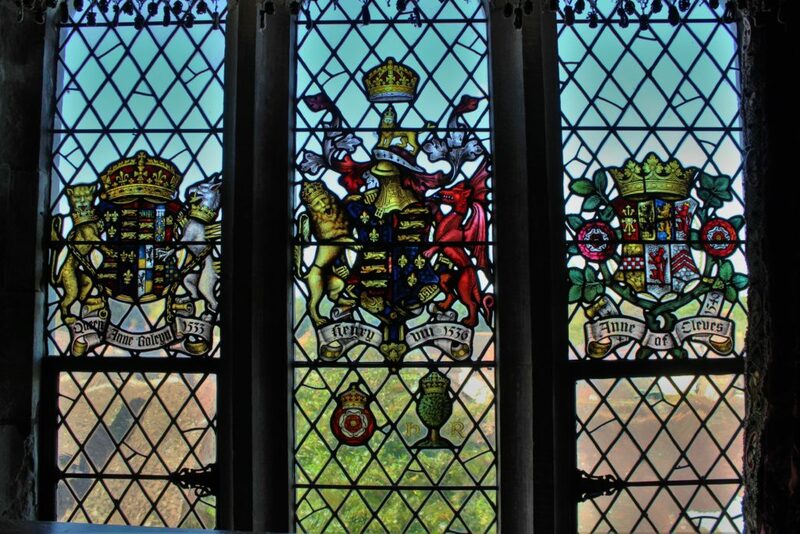 The leaded windows of the Long Gallery are inset with stained glass heraldic achievements featuring at their center escutcheons bearing the arms of, from left to right, Anne Boleyn, Henry VIII and Anne of Cleves, all former owners of Hever Castle. I find these badges of honour with all their decorative elaborations to be very beautiful and full of arcane and esoteric meaning that like a puzzle are fascinating to decipher. I am particularly delighted by the twisting convolutions of leaf and feather “mantling” that flutter from Henry’s helmet. 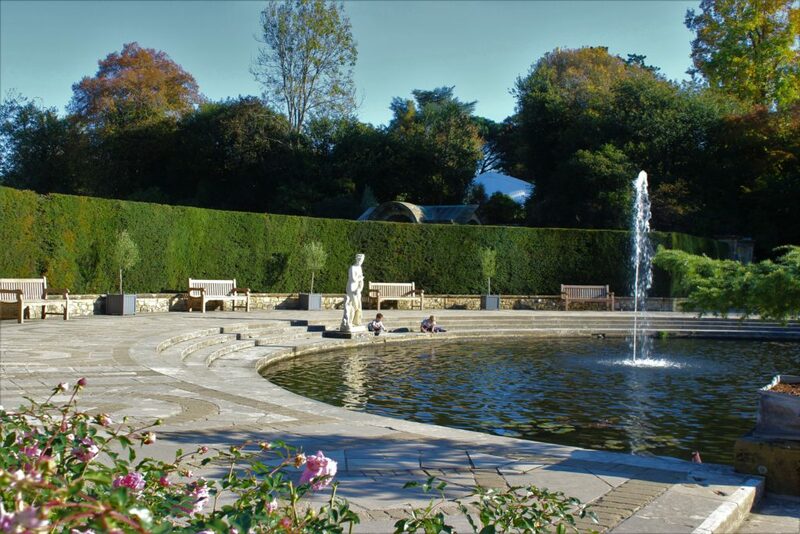 Half Moon pond presents a controlled formality punctuated by a single spire of water saluting a pristine white marble statue of Venus. Innocent of the Goddess’s charms, two boys gaze into the water where elusive goldfish dart and swim. Within the confines of a circular stone garden temple, a classical bronze urn wearing the green patina of age, captures the images of Gods and Goddesses manipulating the fate of heroes. 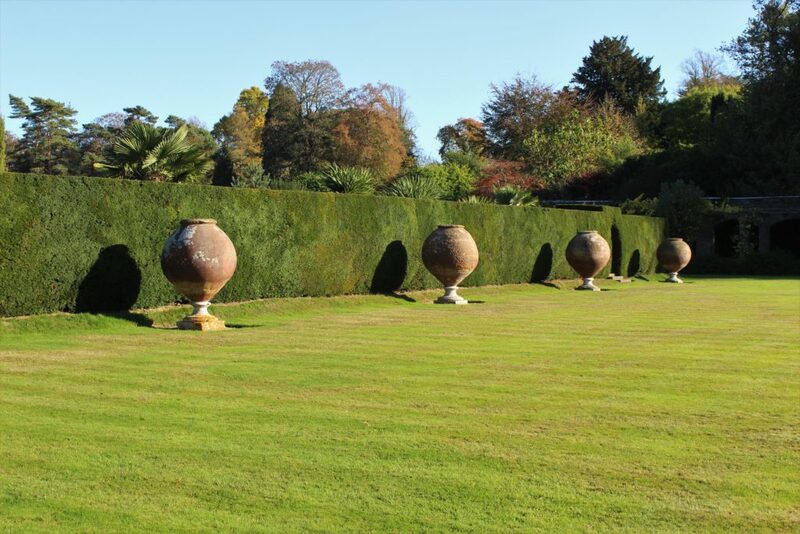 Superb shapes of gargantuan proportions proclaim the arrogance of lordly splendor in the Italian gardens at Hever. Beyond the restraint of clipped hedges an exuberant extravagance of exotic trees sing an alternative tune. Surprised by the glory of deep encounter, lifeless cold marble is ignited by afternoon sun illuminating a brazen kiss. Five triumphal arches beckon and command attention, creating a desire to look beyond the green expanse of easy lawn. What royal court there awaits the traveler on an embassy of idle delight? The bearded sage wraps his cloak tightly around, insulating him from the impertinent intoxication of a scented scarlet rose. Closer to the temple loggia, a parade of chubby putti bear the weight of celebratory garlands as rampant lions roar, warning of the presence of regal dignity. A triumph of arching stone holds the view of tranquil waters where beyond, curtains of trees shelter wild places untamed. From the cover of twisting and drooping branches can be seen the ancient castle walls standing in the midst of folly, the mistress of men allowing herself to be tamed and shaped in order to delight her lover. Is this wise or foolish? This entry was posted in Visiting Beautiful Gardens on February 18, 2019 by ioryallison3.